Each group will be competing against each other to be the first group to reach 31 points. The players will each take three shots – one from the 3-point line, one from outside the key, and one inside the key – and have the potential to score 6 points before passing to the next player in the group. 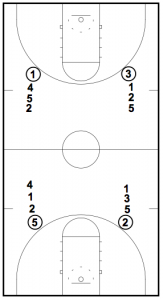 A fun drill that works on shooting from all different spots on the basketball court while at game speed. Easy – Different variations for different levels and ages of players. 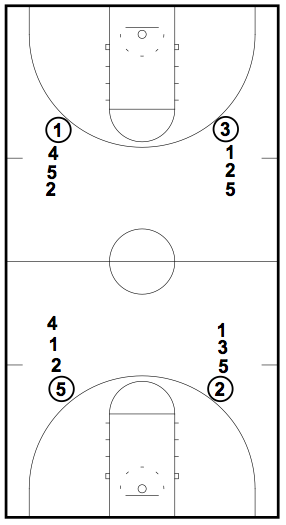 Split the players you have up into 4 even groups and get them to form a line outside the 3-point line on each wing. First person in each line needs a ball. 1. On your whistle the first person in each line will take a shot from the three-point line. If they make it, their team receives three points. 2. Irrelevant of whether the shot is made or not the player will get the rebound, retreat outside of the key, and take another mid-range jump shot. This shot is worth two points. 3. The player will again rebound their shot, and this time they’re allowed to take a shot inside the key. This shot is worth one point. 4. They then rebound the ball once more and pass it to the next player in the group who repeats the same process. As this is a shooting drill, the players’ shooting form is paramount. Make corrections to any poor technique you see. Assign a designated player from each group to be the score keeper. I’ve noticed in the past if you don’t they’ll likely get mixed up. But when someone is given the role it makes it more important and they pay attention. Groups will rotate positions after a team wins that round. I usually get my teams to play four rounds so they will shoot from each wing on the court. Youth basketball – Take away the three-point shot and get them to start at the elbows. This means the game become 21 instead of 31 and the players will only take two shots; one at the elbow worth two points and one inside the key worth one point.